Blueberry crumb cake: Loaded up with fresh blueberries and a sugary crumb topping, this cake is one of the best ways to eat up all those delicious summer berries! As we near the end of my Week with the Barefoot Contessa, I realize that I’ve not yet posted about any of Ina’s fabulous desserts. How I could be so neglectful, I don’t know. I actually made this Blueberry Crumb Cake a few weeks ago to bring to a friend’s house for a girls night dinner but had yet to blog about it. And truthfully, I don’t know why I kept putting it off because this cake was just so great. The crumbs were perfect! They held together well with a great crumbly crunch. And the cake itself was moist, flavorful, and full of delicious in-season blueberries. 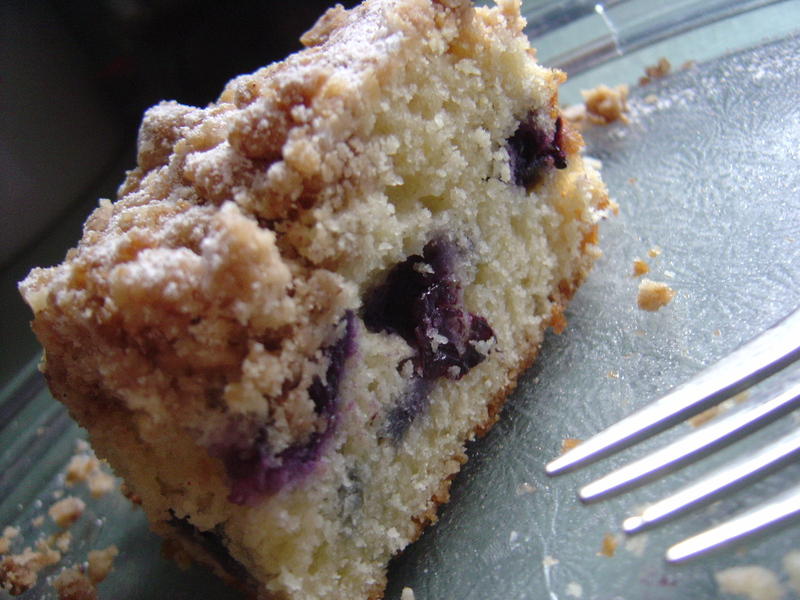 The Blueberry Crumb Cake Conundrum – Homemade or Store-bought? Growing up in New York, I’ve had a lot crumb cake experience to compare this cake to. 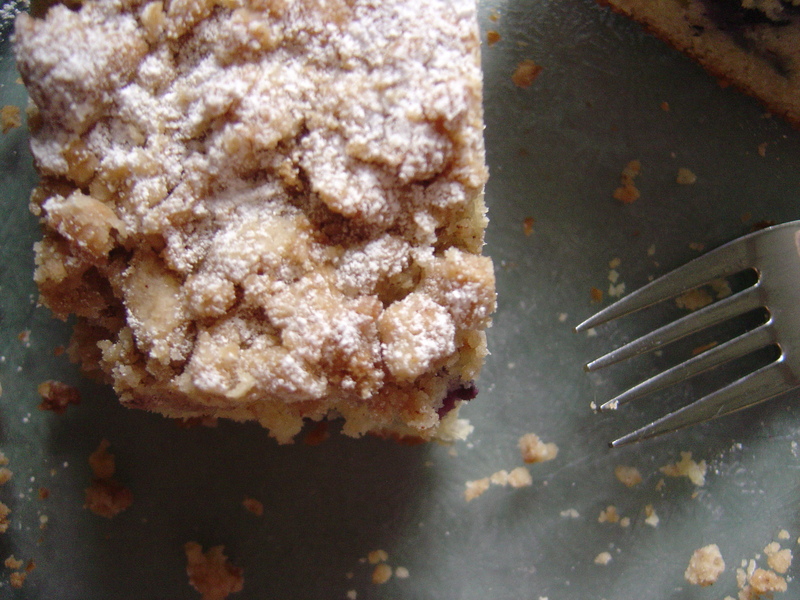 Just about every bakery around had a fresh crumb cake, piled high with crumbs, sitting in the window. And the emergence of the Entemann’s Ultimate Crumb Cake sometime in the mid-90s resulted in a sort of crumb-cake fever that created a standard for all other crumb cakes to aspire to. Buuuut, this blueberry crumb cake definitely stands right up there with some of the best crumb cakes I’ve ever had! I wouldn’t at all feel bad about substituting this cake with my family’s favorite store-bought version either. The whole recipe was a simple one and the only part I struggled with was getting the cake out of the cake pan without losing the crumbs. If I had a 9-inch spring form pan, I would have used that but instead I flipped the cake upside down on to a plate that was larger than the circumference of the cake and then flipped it right side up onto a cooling rack. This worked fine with no issues except losing a few of the crumbs. So, go grab that forgotten pint of blueberries in the back of your fridge and get to making this cake. You won’t be sorry! Fresh blueberries are best in this cake but if you’re in a pinch – or you know, in the middle of winter when fresh blueberries are super expensive – frozen will work ok too. Preheat the oven to 350° F. Butter and flour a 9-inch round baking pan. If you have a 9-inch round springform pan, use this instead. It will make transferring the cake from pan to plate MUCH easier. To make the crumb topping: Combine the granulated sugar, brown sugar, cinnamon, and nutmeg in a bowl. Stir in the melted butter and then the flour. Mix well and set aside. To make the cake: Cream the butter and sugar in the bowl of an electric mixer fitted with the paddle attachment on high speed for 4 to 5 minutes, until light in color. Reduce the speed to low and add the eggs 1 at a time, then add the vanilla, lemon zest, and sour cream. In a separate bowl, sift together the flour, baking powder, baking soda, and salt. With the mixer on low speed, add the flour mixture to the batter until just combined. Fold in the blueberries and stir with a spatula to be sure the batter is completely mixed. Spoon the batter into the prepared pan and spread it out with a knife. With your fingers, crumble the topping evenly over the batter. Bake for 40 to 50 minutes, until a cake tester comes out clean. Cool completely and serve sprinkled with confectioners’ sugar. Amazing timing; I was literally just online looking around for a great blueberry crumb cake recipe, when this came into my Google Reader. I’m taking that as a sign that this is the one! I love the crumblies all around it! This looks delicious! I love crumb cake.